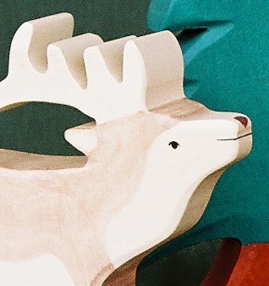 Holztiger wooden animals and figures are handcrafted from solid maple and beech hardwood and hand-painted with nontoxic, water-based acrylic paints. All Holztiger animals are sealed with a nontoxic water lacquer to protect the toys from perspiration and saliva. Holztiger wooden animals are quality toys for quality play. Holztiger wooden figures are recommended for three years and up.